Elslack Roman Fort, North Yorkshire. SD9259 4955. 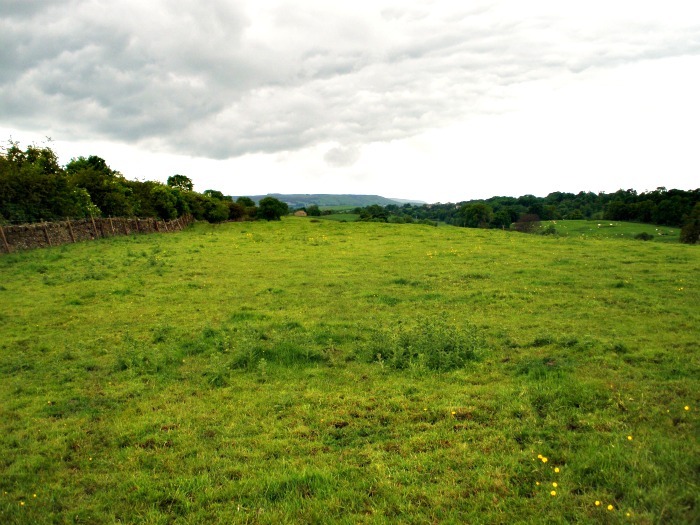 The solitary, rather forgotten earthworks of Elslack Roman fort or Burwen Castle lie just west of Elslack lane beside the disused railway line that linked Skipton with Colne, the course of which is now a pathway. The A56 Skipton road runs close by. 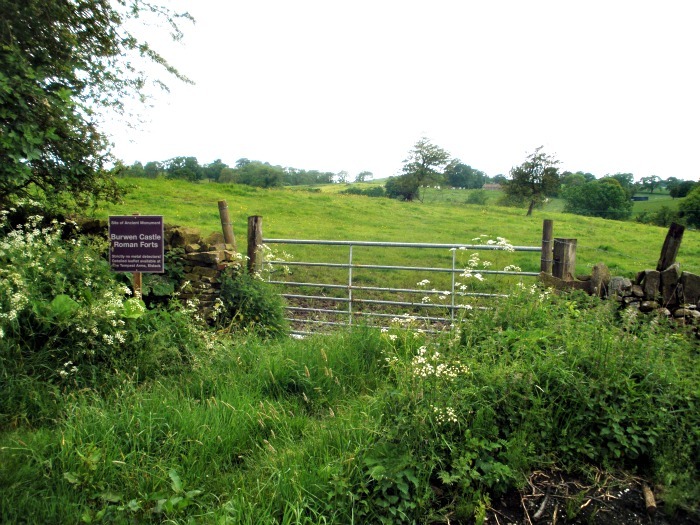 A gate gives access to the site which is often quite boggy. There is not a great deal to see today, but if you look closely you can make out the earthworks that define the outer banks of this rectangular-shaped fort. The fort here at Elslack is probably Olenacum? rather than what some experts claimed it to be, Olicana. The fort at Ilkley is known as Olicana or Verbeia? The first fort was 345 feet (3 acres) within its ramparts, today’s site measures 608 feet by 406 feet, just over 5 acres, with the Thornton beck running close to the north-west edge of the site. It was built during the Flavian period about 80 AD when the area was ruled by the Brigantes. At first it was manned by an infantry garrison then later, in the 2nd century, by an auxiliary cavalry unit of upto 500 men. It was probably originally a small fortlet that was constructed with clay ramparts on top of stone foundations with a double ditch 24 feet in width. In the 2nd century AD the fort was levelled and replaced by a much larger stone-built fort and, then in c340 AD, another stone fortification was built on top of that and this is more or less what we see here today. But in 370 AD the site was abandoned and not long after that the Romans withdrew their legions from Britain for good. The defensive ramparts were upto 9 feet high and, at the western section upto 12 feet high but erosion of the site has now altered that somewhat. As usual there were four gateways, those at the western and eastern sides quite large, the two at the north and south sides were small. The south-east side of the fort has been almost destroyed by the course of the disused railway line, although a small section of the rampart is just visible at the opposite side of the path that now follows the bed of the railway line. The flat plateau between the earthworks is the interior of the fort. A low bank with small trees growing out of it running through the centre of the site is probably more recent in date, perhaps a field boundary, and does not appear to be part of the Roman fort? In the early 1900s two excavations were carried out at the site. Finds included many animal bones, leather boots, a Samian bowl, coins of the Emperors Domitian and Constantine, part of a rotary quern and an artillery projectile from a Roman carroballista machine. These finds were deposited in the Craven museum at Skipton. Then in the late 1980s a geophysical survery was undertaken here which identified a possible building just outside of the eastern rampart, although the interior of the fort did not reveal any buildings, indicating perhaps that they were completely destroyed in 370 AD. The Roman road from Ribchester (Bremetenacum) to Ilkley (Verbeia) and York (Eboracum) intersects here. It is only really visible to the south-west of the site and to the north-east, beyond The Tempest Arms public house. Gate and signboard at Elslack Roman fort. 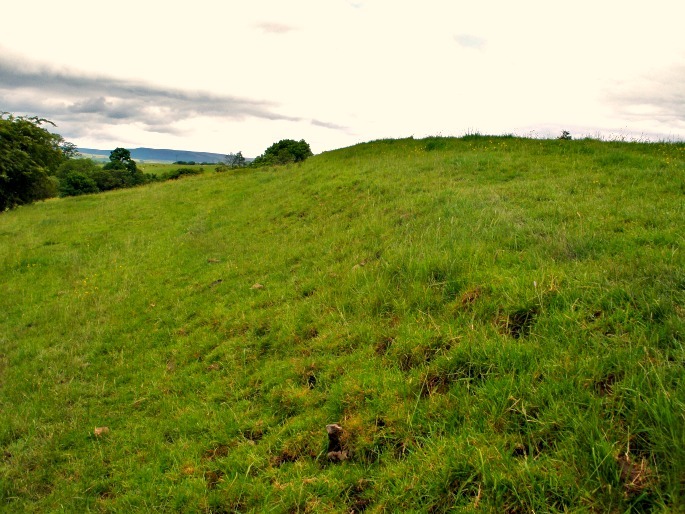 Elslack Roman fort defenses at western side. Categories: Elslack Roman Fort, Roman Sites | Tags: Elslack Roman Fort in North Yorkshire | Permalink.